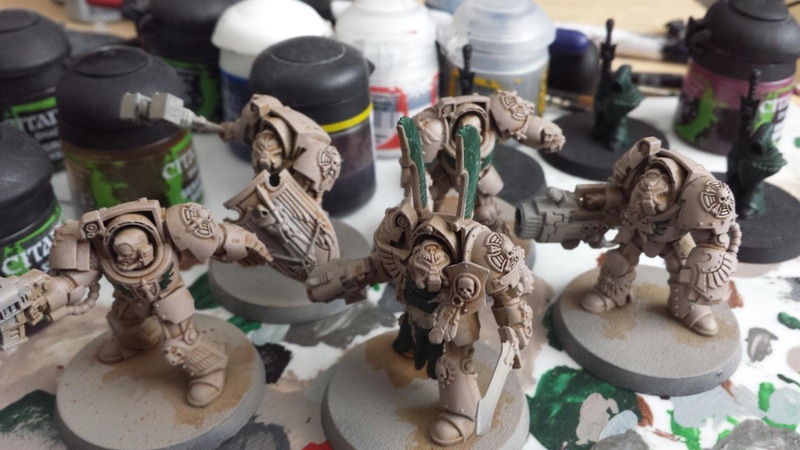 Deathwing Squad Haluiel WIP, new Space Marine models, and thoughts on blogging. My next unit to complete is Squad Haluiel of the Deathwing. It's a standard unit, albeit with a Plasma Cannon. I do love a bit of plasma goodness, and finally Terminators can now take this weapon. It helps that the sculpt is really nice too. I'm knuckling down to get these guys finished as soon as possible. I'm sure the vast majority of you have now seen the new Space Marine models floating around the internet. I won't comment on the rules, as I'd rather wait until the codex is out, but the models themselves are mostly a win. The Librarian and Captain snap fits are cracking, and I'll be picking up a pair for painting. The new Tactical marines aren't that dissimilar to the old sculpts, but sometimes a refresh is good, and the new poses will be good for players with large amounts of standard Marines in their armies. Also, AIMING MARINE! 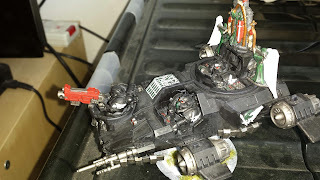 Plastic Sternguard and Vanguard are always good, and the combi weapons will ensure the Sternguard kits will be very popular with any Marine player. The Centurions however...Hooo boy. I just don't get the idea of these at all. The models are just...strange at best, and they don't really even look like they fit into the marine design aesthetic. The fluff part will be interesting too, as now clearly Terminator armour isn't the best available, so why aren't the whole 1st Company of any chapter armed with these suits? I'm looking forward to being convinced, but I do hope they don't try and force them in. The release has me excited though overall. I'm thinking that maybe a small strike force might be an option, but of course the main difficulty is...which chapter?! I've been trying to keep a huge rate of posting up on On White Wings We Ride. Blogging is great as it allows you to share your thoughts and ideas with the community at large, but to me, this content should still have a high quality and also be fun for the blogger. I've started to feel that I'm not providing the quality that I would prefer, all in order to update at least three times a week. This may be due to the slowdown I'm personally feeling in 40K. 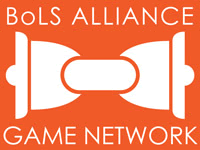 I've played more games in the last year than I have in ten years, which I am incredibly lucky to have a great gaming group. 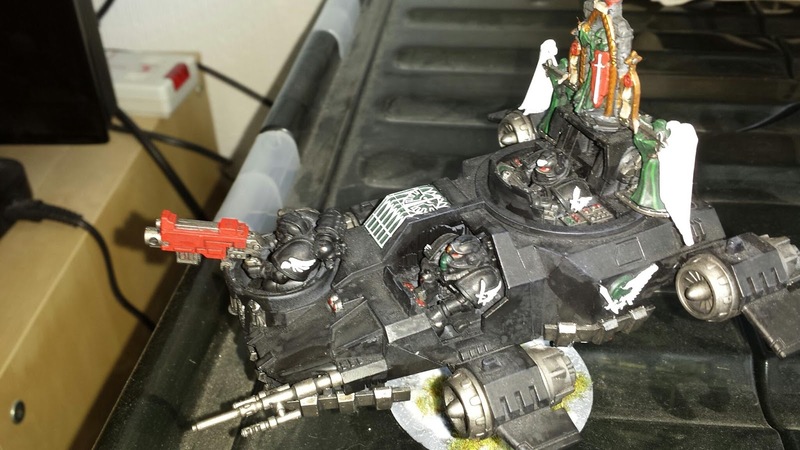 However, so much in such a quick time has led to a little bit of burnout for me personally, and the Nerd Garage have also decided to run a Necromunda campaign in the meantime while we all recharge our 40K batteries. This also allows us time to prepare new armies. I know Danny's getting his Tau finished off, while Pootank is building and painting his new Eldar army and I'll finally be raising my Necron horde. So, with both the blog quality, and the gaming slowdown, I'll be taking OWWWR from a high posting schedule down to maybe one or two posts a week. I hope this means I can look at having more in-depth posts that will hopefully help and enhance both my, and the community's, hobby. I will try and keep the short posts to a minimum, and will refrain from posting for the sake of posting. However, I'd like your thoughts on the above. What do you feel is the best way to run a blog? Lots of small posts, or large posts at intervals? Somewhere in-between? Let me know! Finally finished Caliban's Twilight. Not much to add here, also it did seem to take ages to paint an 80 pt model :P Photos aren't particularly great either as the black seems very washed out, which IRL isn't anywhere near as bad as on here. Oh well, it's done now, and now time to move onto some more Deathwing! 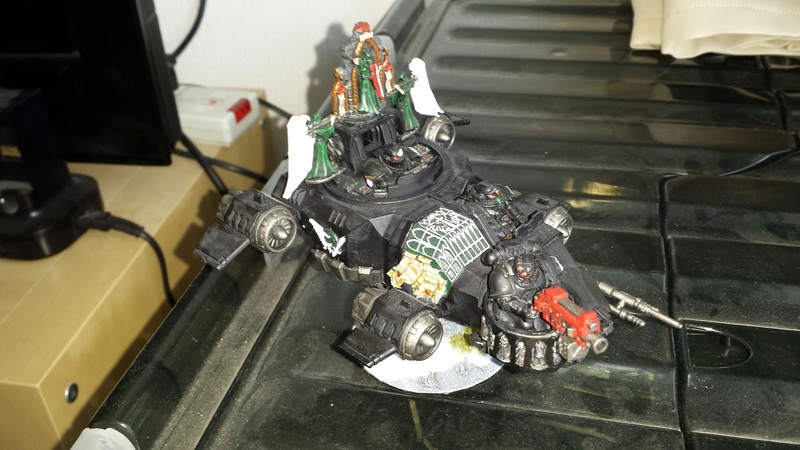 40K veteran of 20+ years. Really likes Space Marines.